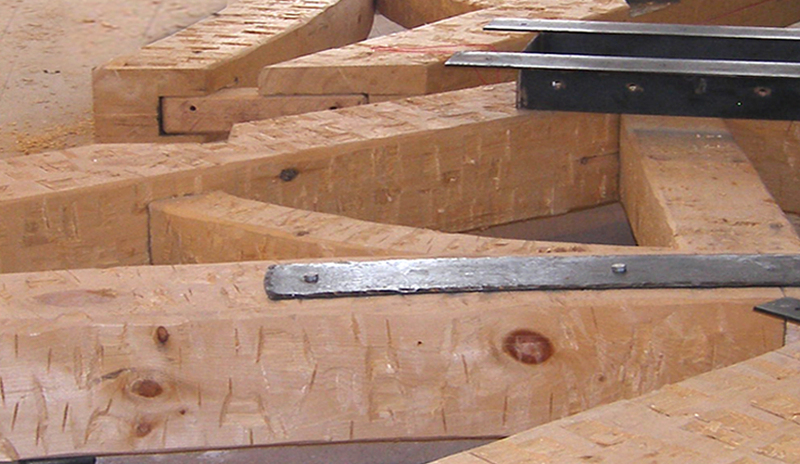 Timber Framing Craftsmanship - Oakleaf Building Specialties, Inc. These trusses were built using traditional joinery technics traditionally used in barns. While these are built as decoration, the method can be the structural framework of a building. While the building style once housed animals, it has some popularity for residences more recently. This type of framing is of necessity a team effort. Due to the sheer weight of the timbers, several strong backs are required. In addition, the layout and joinery need to be checked by multiple sets of eyes to avoid mistakes. A 10”x12”x20’ timber is not something you can pick up at the local lumber yard! Large mallets (known as a beetle, commander or persuader) are used to bump timber around and to help bring joints together. We do use power tools where they can speed the process, but the final fitting is done with hand tools (mallet and chisel, hand planes) in the traditional way. Also, a crane is generally used for a raising (assembling and erecting the frame), but a large volunteer crew is necessary to complete a frame. It usually follows that there is a “topping out” party when the frame is complete.